The customer in Isle of Palms noticed high energy bills and low insulation in their attic. The homeowner requested to have the old insulation removed and had 8" of new cellulose insulation blown-into the attic. This brought their R-value to a recommended level suitable for their home. Now the home is properly insulated and the customers are much more comfortable in their living space. 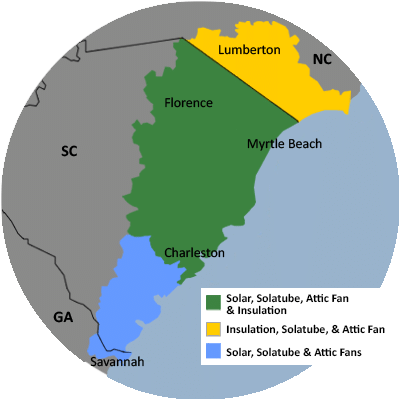 For a FREE no-obligation estimate in Isle Of Palms, SC, please fill out the form to the right and Carolina Energy Conservation will contact you shortly. I need insulation added to my attic, current insulation is inadequate. After flood a few weeks back, we went into crawl space because of foundation problems and discovered moisture barrier plastic like ripped to shreds so we removed all of it. Should we replace it or not. House is on sand. Foundation companies at least 3 say don't put Anything under house. Not sure what to do because it was a moisture barrier now we have no moisture barrier. House is known as a John Long House originally built in 1965. We specialize in a variety of services aimed to lessen your home's carbon footprint and save energy and money each month! We offer it all, from air sealing to ductwork to insulation and HVAC services in Isle Of Palms, SC. For a FREE, no-obligation services estimate in Isle Of Palms, SC, you'll also receive a free copy of "Saving Energy and Money at Home," a great book to use as you begin to create a more comfortable, healthy, and energy efficient home! This photo was taken after all of the old fiberglass insulation was removed and the new insulation was blown into the attic. Richard noticed that the flooring in his home was cupping. This means that the edges of the floorboards were beginning to come up due to moisture. The moisture was coming up through the crawl space causing this damage to the flooring. Before he got new hardwood flooring, Richard M. wanted to get the moisture underneath his home under control. He gave Carolina Energy Conservation a call and our comfort specialists set an appointment to evaluate the crawl space. After the evaluation, the foreman decided to lay a vapor barrier on the floor of the crawl space and install a SaniDry dehumidifier to keep the moisture out from under the home. Now the crawl space is dry and healthy and Richard is enjoying his new wood flooring!